Groups should have this activity pre-booked. Cost of Orienteering is per map or materials, see below. 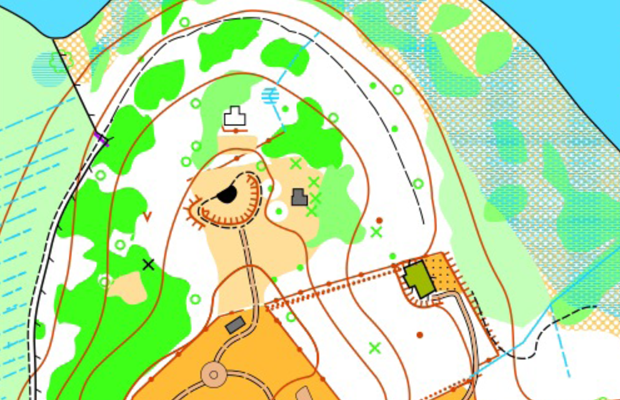 Orienteering is a versatile activity and can be done anywhere, from a dense forest to a playing field. This means that a course can be fixed or changed regularly and difficulty can also be changed to suit the groups involved. All you need to get started with orienteering is to have a sense of adventure, outdoor shoes and clothing, and of course a compass and map. Tracking signs, this can be incorporated into String course above or completely separate. Sheet available free of charge as a guide for Leaders. Introducing Compass Bearings. Located in the back car park you will find 8 plinths/raised platforms painted different colours. A scout should stand on each, with their compass and work out the bearing of the other 7 scouts. A master control sheet is available for leaders. Activity free is you have your own compasses, or cost is €2 for rental of compasses. Any compasses unreturned will be charged out to group at full price. €30 per compass. unreturned units will be charged at €150 each. It is recommended this is tried before doing Geocaching. Ensure group knows the dangers of running over rough terrain, and possible trip hazards such as tree stumps and uneven ground. Ensure group knows the boundaries of the course, and if lost finding their way back to the centre. Ensure group know where the main road to the centre is and being cautious while on the main roadway up. Wear appropriate footwear, Orienteering is not a sport for flip flops or sandals. Ensure group has adequate water with them for drinking if on the longer courses during hot sunny weather. Ask group to Orient the map, point to features on the map and correspond it to the ground. Introduce thumbing the map. Explain the control card and how it works. Time each individual/team. Cost of this activity is €2 Per map and control card. Intermediate: Spread over 100 acres of ground. Cost of this activity is €2 per map and control card. There is a leader board for the fastest run course, don’t forgot to get your time recorded for the Castle Saunderson “Top Gear” Orienteering leader board! Have you tried Geocaching? A treasure hunt using GPS handheld devices, to locate where your treasure is hidden. There are over 12 hidden on the estate. Enquire at reception for more details.